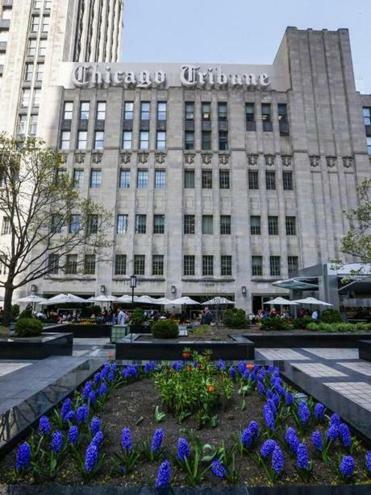 The Chicago Tribune is among the Tribune Publishing Co. newspapers that the Gannett Co. is seeking to buy for $815 million, including assumption of the company’s debt. NEW YORK — The Gannett Co. has offered to acquire the Tribune Publishing Co., which owns newspapers including The Los Angeles Times and The Chicago Tribune, for about $815 million including the assumption of debt. Gannett’s proposal, disclosed Monday, is for $12.25 a share in cash — a premium of 63 percent to the company’s closing stock price Friday. Tribune Publishing’s shares closed at $7.52 on April 22. According to a letter disclosed by Gannett, Tribune Publishing was unwilling to engage in discussions about a takeover, so the offer was made directly to stockholders. In a separate statement, however, Tribune Publishing said it had hired advisers to review the proposal. Tribune Publishing was spun off from Tribune Co., now called Tribune Media, owner and operator of 42 broadcast stations, in August 2014 and saddled with about $350 million in debt. Since then, its stock has tumbled as Tribune Publishing’s newspapers, like many print publications, have struggled with declining circulation and dwindling print advertising revenue. Michael Ferro, a Chicago entrepreneur, acquired a stake worth $44 million at the time in Tribune Publishing in early February through his Merrick Ventures. Less than three weeks later, Jack Griffin was replaced as chief executive by Justin C. Dearborn, a close associate of Ferro’s and the former chief executive of Merge, which was acquired by IBM. Soon after, Tribune Publishing announced it was combining the role of editor and publisher across its portfolio of newspapers, a decision that raised eyebrows in the media world. The recent upheaval at Tribune Publishing is the latest the company has faced. Soon after the real estate tycoon Sam Zell bought the company’s predecessor for $8.2 billion in 2007, it filed for bankruptcy, with $7.6 billion in assets against a debt of $13 billion. The culture at the company had turned poisonous, and Tribune Tower, once a symbol of a great media company, became a place where executives used sexual innuendo and profane invective. In recent years, The Los Angeles Times has become a flashpoint for disagreement between Tribune Publishing and its California newspapers. Austin Beutner, The Times’ publisher, was ousted last fall after only a year in the position because company executives viewed his ambitious plan to dominate California journalism as defiant and a threat to their centralized strategy. The newsroom has been reduced by job cuts. The philanthropist Eli Broad has long sought to buy the paper, but his moves have been spurned. In a further sign of discontent between Tribune Publishing and its California newspapers — in addition to The Los Angeles Times, the company also owns The San Diego Union-Tribune — the two entities have sparred over financial projections. More recently, Tribune Publishing failed in its bid for Freedom Communications, which owns The Orange County Register and The Press-Enterprise of Riverside, California, after the Justice Department objected to the deal. Ferro and Dearborn have had several phone conversations with Gannett since the media conglomerate sent its first letter April 12, according to Gannett’s most recent letter, published Monday. The two have been unwilling to begin “constructive discussions” with Gannett, the letter said. Gannett decided Monday to go straight to Tribune Publishing’s shareholders. “Given the opportunity to benefit from the significant premium and near-term liquidity, we are confident that Tribune’s stockholders will embrace our offer,” said Robert Dickey, the president and chief executive of Gannett in the newly disclosed letter.